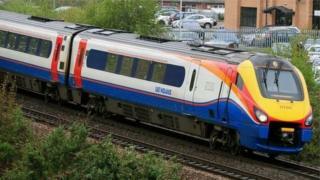 A decision to cut peak-time East Midlands train services to and from London has been branded "scandalous". Trains to and from London will no longer stop at Bedford and Luton at peak times from May. The Mayor of Bedford Dave Hodgson said it was "scandalous" and "an utter disgrace". East Midlands Trains (EMT) says the changes have been made to introduce a new Thameslink timetable as part of the Midland mainline upgrade. Thameslink will provide seven services an hour between Bedford, Luton and London during peak times. Two of those trains will become fast services, calling only at Bedford, Luton, St Albans and London St Pancras. This means passengers at smaller stations such as Flitwick and Harpenden will lose two trains an hour. EMT customers who commute from Leicestershire and Northamptonshire to Bedford will be provided with a coach service which will connect with trains at Wellingborough. The company has said season ticket holders who use the replacement coach service will receive a 50% discount on their ticket. In a statement on his website, Mr Hodgson said: "This scandalous announcement will cause huge upheaval in people's lives. "Coming days after the announcement of yet another inflation-busting fare rise it's a disgraceful betrayal of Bedford rail users." Jake Kelly, managing director for East Midlands Trains, said: "To enable major projects to be completed, there will have to be some changes to our services and we appreciate that this will mean inconvenience for some customers." The changes will come into effect on 20 May 2018 and are due to last until the completion of the Midland mainline upgrade in 2020.